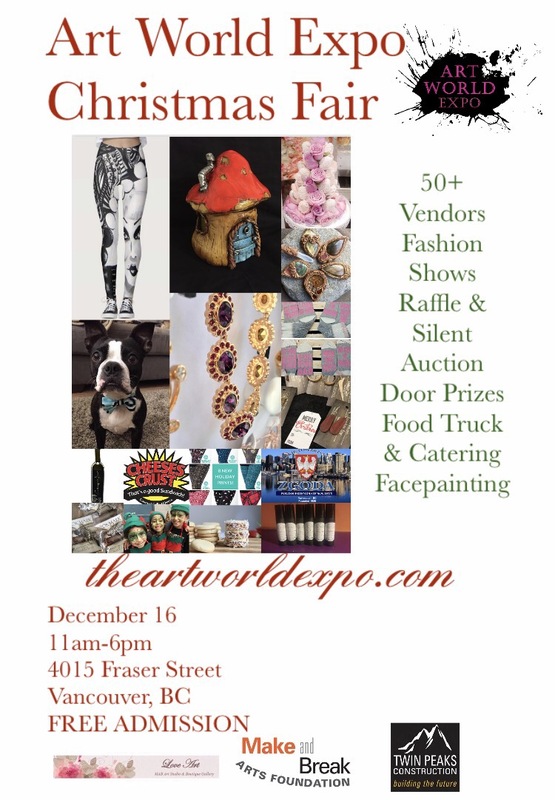 Art World Expo Christmas Fair! Tomorrow we invite you all to our Christmas Fair at 4015 Fraser Street in Vancouver, BC. Over 50 participating Artisans, vendors, and designers who are selling a variety of goods and services! Art, fashion, jewellery, home decor, knitting, make up, skin care, health and wellness, desserts, and so much more! Finish all your shopping, support local and even enjoy lunch with us! Best part is that we invite all ages and it’s free to attend! We have 100 swag bags for the first 100 people too-great items inside include essential oil from SPOIL YOURSELF, Art by Elizabeth Hill, a copy of Fresh Magazine, one free art class at MAB Art Studio & Boutique Gallery and an It Works drink sample to keep you healthy! Learn more on our Facebook event page Here. Our event auction, Christmas earrings and coffee sales are supporting two causes. The first is to help fund our new creative arts and wellness centre opening in North Vancouver in the Spring. The second is to support a member of our Art World community with cancer. Please be sure to buy a coffee, bid on items in the auction and purchase a pair of these earrings by Monika Colmorgen for $7! ​if you can’t make it and you’d like a pair of these earrings, please email us at artists@theartworldexpo.com or call 6049996177.